There's a story on Buzzfeed today about the singer Fiona Apple canceling a tour because her dog is dying. The story copies a long, emotional letter about her relationship with the dog. A few years ago, in the scheme of life, my wife and I had tickets to a Mary-Chapin Carpenter concert. It was at a beautiful venue, and we had (thanks to the wheelchair) front row seats. Carpenter was one of my wife's favorite performers, and I like the Americana vibe to her music, and so we sat, happily waiting as the hall filled, and then the promoter came out to announce the show would be canceled because Carpenter's dog was ill. I seem to remember the dog wasn't with her on tour, but back in Nashville, and so she must have taken off east to be with the animal. All this comes to mind because I looked down at my little Boston one morning last week and noticed a large bump on her side. I touched it. It doesn't seem painful to her, but at nearly thirteen years of age and having survived a couple of tumor surgeries and a broken hip, she's close to the end, I know. Her name is Kitty, an ironic appellation in remembrance of my father calling "kitty, kitty, kitty" to bring the barn cats for a fresh milk treat. 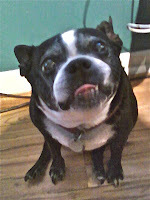 The Boston I had then, her name was Muggs, would take off for the barn to join in the treat. Kitty has been my dog since we brought her home to help one of our boys who needed to focus on a living thing outside of himself, being in the middle of tween angst and undiagnosed depression. She loved him, of course, and my wife and other son, but she seemed to think she'd been assigned to protect the fellow in the wheelchair. When a stranger approached, she would hop in my lap, and if they came to close, she would snap at them. In her prime, we called are a concentrated Rottweiler, a tag she earned when a Great Dane tried to attack a group of us walking. She latched onto the Dane's throat and held on until its owner came and corralled the dog. "I hope she didn't hurt your dog," the woman said, but Kitty was only panting. The Dane was bleeding. She will die, like all living creatures, and we people who consider ourselves civilized do not allow animals to suffer. That means euthanasia, which is a hard choice in more ways than one for me. Kitty has to be muzzled to attend the veteranarian, and I cannot think it a pleasant experience for a loyal, loving friend to be bundled off to a place she hates, trembling with fear and anger, to be muzzled. And killed. I was friendly with a veteranarian long ago, and I think he was the sort of man who would sell me the drug to do it myself, which I could, I think. But now, given all the regulatory hysteria over narcotics, I doubt any veteranarian would risk a license to practice. That leaves a firearm. Or perhaps the complicated process of instructions for home euthanasia. There is no good choice. Today I only want to pick up her leash and walk her back along the trail to her days of joy. She will grab the leash out of my hand, shake it, shake it, shake it, and then hop into my lap so I can snap the clip. Then she'll jump off, holding the leash in her jaw, and wait for me to open the door. Kitty will run out onto the lawn and wait until I tell her to bring me the leash, and with a quick half-hitch around the frame of the wheelchair, we'll be off, winding the years back down to puppyhood so that we might live all those good times once more, and perhaps better. There is a special bond between dogs and humans. Because we usually outlive our pets, that bond gets broken, and it's always painful. We let go because we have no choice, and they leave us with cherished memories.